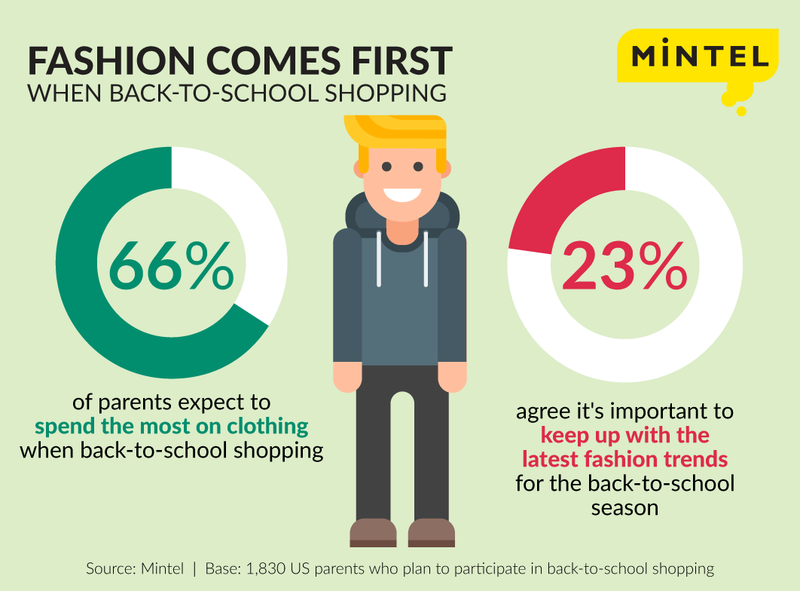 Back-to-school shopping season is just around the corner, and parents plan to increase their budget for the largest summer retail event in the US: the latest research from Mintel reveals that 52 percent of parents plan to spend more on back-to-school (BTS) shopping in 2016, with a mere 4 percent of parents planning to spend less. However, while reported spending is up in 2016, the overall BTS market, which spans elementary school through college, remains stagnant. After hovering between $73-76 billion annually from 2010-14, total planned BTS spending dropped to an estimated $68 billion in 2015. When BTS shopping, parents expect to spend the most on clothing (66 percent) by a wide margin, with footwear in a distant second (11 percent). Further, one quarter (23 percent) of parents agree that it is important to keep up with the latest fashions for the BTS season. School supplies (8 percent) are less likely to command parents’ hard-earned dollars, as school supplies are generally low-cost. Interestingly, spending on electronics (8 percent) is tied with school supplies, playing a role in stalled overall BTS revenue as more school-provided technology may erode spending on big-ticket devices. When looking at the factors that influence BTS shopping decisions, recommendations by schools lead the way with 43 percent of parents ranking it as one of their top three sources for information, up from 32 percent in 2015; familiarity with products or brands is also a popular influencer (42 percent). Coupons, which were the leading influencer among parents in 2015 (43 percent), appear to be of less importance this year (36 percent). Children also play a large role in BTS shopping, with nearly two in five (37 percent) parents agreeing that their children have a strong impact on the BTS products they buy. What’s more, Mintel research shows that parents say “yes” more than half (53 percent) the times their kids ask them to buy things. However, some parents view their children as a barrier to BTS shopping, with one in five (19 percent) agreeing that it’s difficult to shop efficiently when their children are in tow, while over half (56 percent) feel like their kids constantly ask them to buy things. This may compound the stress that 22 percent of parents say they feel when BTS shopping. “Our research shows that parents display an affinity for familiar products, so brands should emphasize marketing back-to-school items that are the same or similar to those that parents once used, while retailers would benefit from promoting products for children that are developed by brands popular with adults. Retailers can also ease the back-to-school process by promoting digital tools such as shopping registries and apps that provide schools’ recommended supply lists, which will help streamline the shopping experience,” continued Lipson. Mintel research indicates that parents are interested in a greater variety of delivery options in order to streamline the BTS shopping experience. In fact, half (48 percent) of BTS shoppers would like to see greater availability of free shipping for online purchases, while one in five (20 percent) are interested in home delivery for items purchased in-store. Other highly desired improvements parents would like to see when BTS shopping include a faster checkout process and larger product selection (40 percent respectively). “Today’s shoppers expect to get products through methods that are most convenient to them, without paying more. While free shipping is always desirable, it’s of added interest for back-to-school items which are often relatively inexpensive, making even a low, flat shipping fee unpalatable. With convenience in mind, improvements such as self-checkout lanes, express lanes, or arming store staff with mobile devices for on-the-spot checkout will resonate with parents and can offer a point of differentiation against other retailers during the back-to-school shopping season,” concluded Lipson. Press copies of the Back to School Shopping US 2016 report and interviews with Ali Lipson, Director of Retail and Apparel, Technology and Automotive Reports, are available on request from the press office.